The Lincoln National Forest uses a variety of vegetative management tools to improve forest health. In April and May of 2010, the Sacramento Ranger District completed the Walker prescribed burn project of approximately 1,270 acres, east of Weed. While the overall project culminated with the burn which was highly visible to visitors and residents, the project involved a number of other management tools used to prepare the area for the burn. The first part of the project involved hand cutting of thick Piñon- Juniper stands in five acre blocks, leaving only 4 to 5 of the largest trees per acre. The block·s were cut in a mosaic pattern leaving uncut buffers of 50 to 200 feet between the blocks to maintain adequate cover for wildlife. The cut areas were then opened for commercial and personal fuel wood permits. In ponderosa pine dominated canyon bottoms, approximately 240 acres within the project area were commercially thinned to a density level of 40 to 70 trees per acre. Two wildlife water points were constructed in the project area to increase water availability. In the spring of 2010, conditions offered an opportunity to implement the last phase of the multi-year project which involved prescribed fire. The primary objective of the planned burn was to clean up slash generated by the project. This would allow for increased vigor and availability of browse and forbs, and decreased fire risk by reintroducing fire into the ecosystem under favorable conditions. Effective use of prescribed fire as a management tool includes balancing factors such as temperature, relative humidﬁity, wind, and fuel moisture in conjunction with fuel type and topography. Tremendous amounts of planning go into each prescribed burn to minimize risk and provide for fire fighter safety and protection of private property. 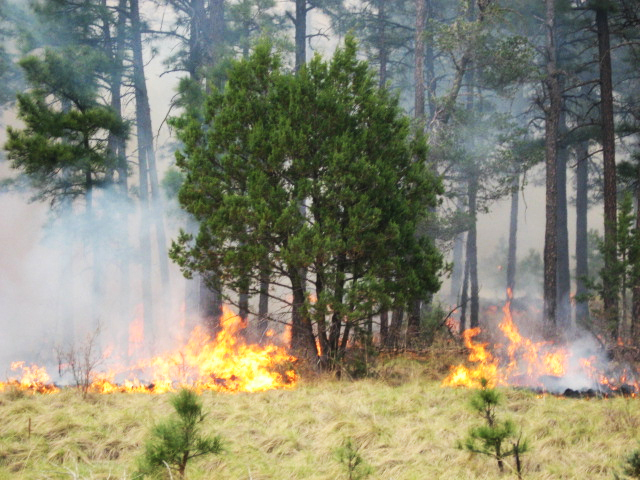 Smoke generated by prescribed burns can be a concern for residents. Smoke management is administered by the NM Environmental Department Air Quality Bureau. The Forest Service works closely with this agency to ensure smoke generated from prescribed burn projects does not become a health issue for affected area residents. 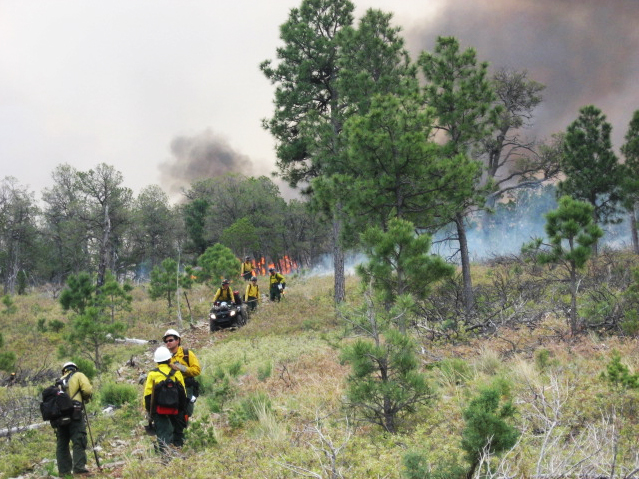 Traveling between Weed and Piñon along Highway 24 will take a person right through the project area where they can see the results of a successfully implemented prescribed burn. Don’t be surprised if there is a lot of wildlife inside the burn area. Wildlife are attracted to burn areas because there is a flush of new nutritious growth after fire. Monitoring data will continue to be collected in the Walker project area to determine the long-term effects of the project as well as guide managers in the implementation of future projects. In 2009, the Lincoln National Forest approved the use of another management tool designed to gradually introduce wildfire back into forest ecosystems allowing wildfire to fulfill its natural role. The tool involves utilizing wildfire started under natural conditions (lightning) to be managed for multiple resource objectives. The Lick Ridge management area has been chosen by the Sacramento Ranger District as an initial location to implement this. This area is roughly 41,000 acres or 64 square miles and is located in the very southern portion of the district in the Pinion Draw area. Managing wildfire for multiple objectives which includes resource benefit is another tool, along with prescribed fire and thinning, that can be used to achieve resource objectives, including; protection of values at risk such as area resources, communities at risk, improvements, and communication siteøs. If a wildfire starts naturally, different objectives and tactics can be used in different parts of the fire. This process will utilize the Wildland Fire Decision Support System, and takes into consideration local conditions that govern fire behavior such as weather, topography and fuels, as well as the needs of communities and cooperating agencies. This article originally appeared in the September 2010 print edition of The Mountain Monthly.